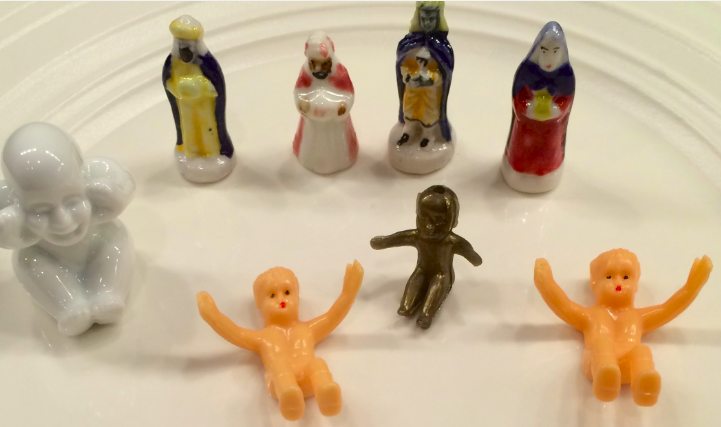 Yesterday was Epiphany, meaning it is now the season for King Cakes. Mardi Gras this year is on February 17, so you’ve got a little more than a month to celebrate. Can’t go to New Orleans? Fear not. 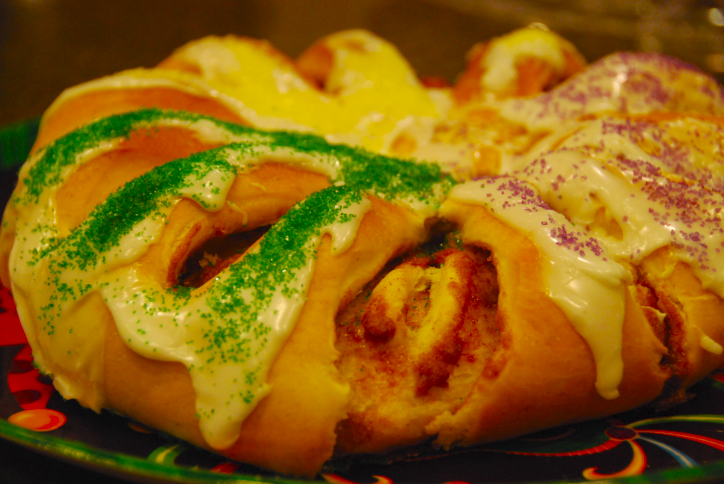 Try this recipe for King Cake, which was adapted from Bunkycooks. Celebrate Mardi Gras with this delicious (and nut free) king cake! Of the top eight food allergens, this recipe is free of peanuts, tree nuts, soy, fish, shellfish. For pastry: Scald milk, remove from heat and stir in 1/4 cup of butter. Allow mixture to cool to room temperature. In a large bowl, dissolve yeast in the warm water with 1 tbsp of the white sugar. Let stand until creamy, about 10 minutes. When yeast mixture is bubbling, add the cooled milk mixture. Whisk in the eggs. Stir in the remaining white sugar, salt, and nutmeg. Beat the flour into the milk/egg mixture 1 cup at a time When the dough has pulled together, turn it out onto a lightly floured surface and knead until smooth and elastic, about 8 to 10 minutes. Lightly oil a large bowl, place the dough in the bowl and turn to coat with oil. Cover with a damp cloth or plastic wrap and let rise in a warm place until doubled in volume, about 2 hours. When risen, punch down and divide dough in half. Preheat oven to 375 degrees F (190 degrees C). Grease 2 cookie sheets or line with parchment paper. For filling: Combine the brown sugar, ground cinnamon, chopped pecans, 1/2 cup flour and 1/2 cup raisins. Pour 1/2 cup melted butter over the cinnamon mixture and mix until crumbly. To assemble: Roll dough halves out into large rectangles (approximately 10×16 inches or so). Sprinkle the filling evenly over the dough and roll up each half tightly like a jelly roll, beginning at the wide side. Bring the ends of each roll together to form 2 oval shaped rings. Place each ring on a prepared cookie sheet. With scissors make cuts 1/3 of the way through the rings at 1 inch intervals. Let rise in a warm spot until doubled in size, about 45 minutes. Bake in preheated oven for 25 minutes. Push the baby into the bottom of the cake. Frost while warm with the confectioners’ sugar blended with 1 to 2 tablespoons of water and tsp vanilla. You may want to make the icing separately for each cake, as the icing hardens quickly. You may also cover the icing with purple, yellow, and green sprinkles in the spirit of Mardi Gras. Enjoy, and happy Mardi Gras!! I’d never heard of these kinds of cakes before! It looks so good! This looks delicious! I really enjoy your blog and how organized it is! First off… I LOVE your name for your blog! Secondly, this looks so yummy!! They are huge in New Orleans. My family makes them every year and I love them!